We are UNISON South West, made up of 90,000 public service workers. From hospitals to town halls, schools to street cleaners, libraries to police stations, we are the people who keep Britain going twenty-four hours a day, seven days a week. Our members unite together in the belief that all workers deserve to live with dignity and get proper recognition for the vital services they provide. We are for everyone who wants fair, healthy and productive workplaces and our members strive to build a better society in this image. Problems at work or at home can affect anyone. UNISON represents members when issues arise in the workplace, and we are a source of support and advice throughout life. Could you volunteer in your workplace? UNISON is committed to whole-life education. We partner with adult learning organisations as well as training our own tutors, so public servants can develop skills for work and life. Employers value our contribution and we make sure workers have access to learning in return. UNISON is its members – ordinary people who commit to making society better. Our priorities and campaigns are voted on by our members and our governance bodies are elected regularly. In the South West, Joanne Kaye is our Regional Secretary charged with delivering on members’ priorities. 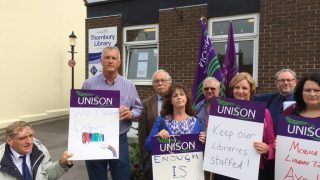 Stop the South Glos library cuts!